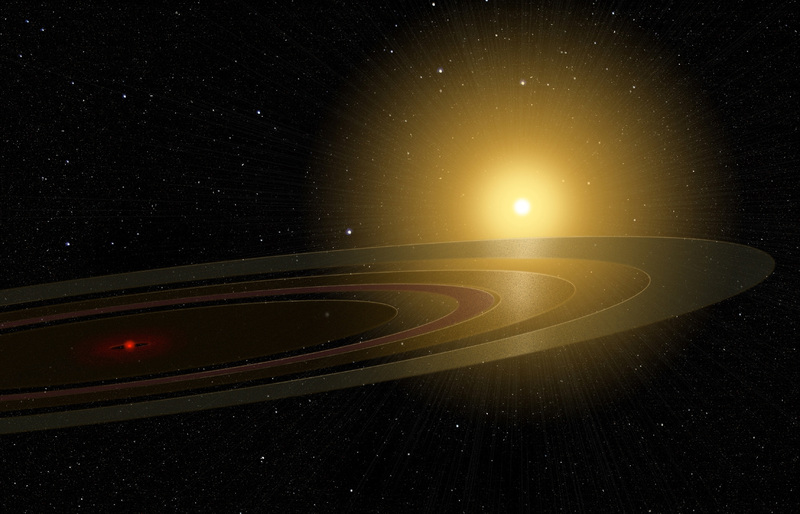 Astrophysicists have for the first time observed a Saturn-like ringed planet orbiting a star like our own. The scientists, led by Assistant Professor of Physics and Astronomy Eric Mamajek of the University of Rochester and the Cerro Tololo Inter-American Observatory, used data from the international Super WASP (Wide Angle Search for Planets) and All Sky Automated Survey (ASAS) project to identify the planet. The star in question is technically known as 1SWASP J140747.93-394542.6. It has a mass similar to the sun but, at about 16 million years of age, is much younger, just 1/300th as old as the sun. It lies about 420 light-years away. It’s the first time astronomers have detected an extrasolar ring system transiting a Sun-like star, and the first time that discrete, thin dust rings have been found around a very low-mass object outside our solar system. The object at the center of the ring system is either a very low-mass star, brown dwarf, or planet. The answer depends on whether or not it’s big enough to sustain thermonuclear fusion reactions during its projected lifetime. If the object’s mass is less than. Mamajek and his team hope to use southern hemisphere telescopes to establish the radial velocity of the star and detect the gravitational tug and light of the companion. Along with the central object, Mamajek is interested in what is taking place in the two large gaps between the rings. Gaps usually indicate the presence of objects with enough mass to gravitationally sculpt the ring edges, and Mamajek thinks his team could be either observing the late stages of planet formation – if the transiting object is a star or brown dwarf or possibly moon formation if it’s a giant planet.